Korean Air: "A Global Leader"
Established in 1962, Korean Air is the largest airline and flag carrier of South Korea. From its base at Seoul Incheon International Airport, Korean Air serves extensive domestic and international networks. The carrier's cargo division, Korean Air Cargo, is the third largest cargo airline in the world and it also wholly owns a low cost airline subsidiary, Jin Air. Korean Air is a founding partner airline of the SkyTeam alliance. Capa Aviation. SEOUL, Korea � Korean Air, South Korea�s flagship airline, has announced to increase frequency on its routes to Canada and China. From 20 June, the current five flights a week between Seoul/Incheon and Vancouver will be increased to daily flights, with flights to Toronto also increased to daily from 24 June. The flights between Seoul/Incheon and the Chinese destination Jinan will increase from four times a week to seven times a week between 1 July and 31 august. Korean Air�s service to Vancouver will depart from Seoul Incheon at 18:50 and will arrive in Vancouver at 12:35 the same day. The return flight will depart from Vancouver at 14:35, arriving Seoul Incheon at 17:50 on the next day. Korean Air will replace the B777-200 (seating 261 passengers) currently used on the Vancouver route with the B747-400 (seating 365) in order to meet the increasing demand on this route. Korean Air�s service to Toronto will depart from Seoul Incheon at 10:00 and will arrive in Toronto at 10:15 the same day. The return flight will depart from Toronto at 12:15, arriving Seoul Incheon at 14:55 on the next day. Korean Air�s service to Toronto will be operated by B777-200 seating 261 passengers. 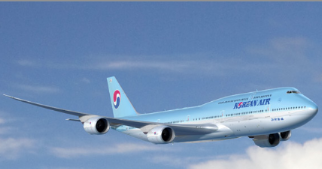 Korean Air�s service to Jinan will depart from Seoul Incheon at 13:15 and will arrive in Jinan at 14:05 the same day. The return flight will depart from Jinan at 15:05, arriving Seoul Incheon at 15:45 the same day. Korean Air�s service to Jinan will be operated by B737-800 equipped with AVOD system. The increased frequency on Korean Air�s routes to Canada and China is a part of ongoing strategy to give passengers greater choice and flexibility when traveling. KAL has a goal of becoming a respected leader in the global airline industry by maintaining some of the most stringent safety standards in the industry while offering our customers exceptional products and service. above and beyond normal expectations." Korean Air's extensive route structure spans the world with one of the industry's youngest fleets. Every year, Korean Air makes considerable investments to modernize our fleet with the goal of using only five aircraft types by 2009. Fleet simplification and modernization eventually will reduce operating costs, improve operational efficiency and make us a stronger airline. Our newest international routes &endash; especially those in China and Vietnam &endash; are establishing our foundation for future growth. A record-breaking 55 new international route frequencies were allocated to Korean Air during 2002. Three new China cities &endash; Jinan, Yantai, Xiamen &endash; bring our total Chinese routes to 16, with more than 80 flights per week. Overall, Korean Air flies to 84 cities in 29 countries. Equally important is our membership in SkyTeam, our airline alliance that includes Delta Air Lines, Air France, Aeromexico, Czech Airlines and Alitalia. SkyTeam allows Korean Air customers to take advantage of SkyTeam hubs and benefits on more than 8,000 flights to 500 cities in 114 countries around the world. SkyTeam also allows us to expand our reach without major capital investment. SkyTeam is the world's only "customer-focused" airline alliance and customer satisfaction is more than a word, it's a philosophy at Korean Air. And this philosophy has attracted international attention. For example, this past year, Business Traveler magazine honored us for having the best wine cellar in the Sky. Our food service has won international awards, and our catering kitchens are always looking at new menus to please our passengers. Meanwhile our cabin crews in all sections of the plane are trained meticulously to attend to our travelers' needs. Travelers and critics alike have consistently praised our sleeper seat service to the U.S. and Europe. This premium class service features full-flat sleeper seats that are almost two feet wide and recline 180 degrees. Passengers are provided exquisite traditional Korean or western meals; Dom Perignon champagne is standard. When they are ready for sleep, passengers are offered custom KAL pajamas that they're welcomed to take home. enough so that Air Transport World named us its 2003 Cargo Airline of the Year, an international honor. We operate one of the world's largest freighter fleets and for the past decade, have been ranked one of the world's the top five cargo carriers by IATA. We're constantly introducing more products to better serve our cargo customers. For example, we've got a service called SkyBridge to make it easier and more expedient to ship products and goods to China, using a coordinated logistics system on land, sea and air. SkyBridge uses our parent company Hanjin's resources for shipping and trucking. This one-stop service saves time and money, especially for shipments to and from the U.S.
Korean Air is the only commercial airline in the world with a passenger, cargo and aerospace division. Korean Air's aerospace division started South Korea's aircraft manufacturing industry in 1976. As a pioneer in this field, the aerospace division has, over the past 27 years, successfully produced such military aircraft as 500MD helicopters, F-5E/F fighters, UH-60 mid-size helicopters as well as supplied parts to leaders in the field such as Boeing Co. and Airbus Industries. Korean Air's award-winning maintenance and engineering division has created a culture that nurtures technical excellence, efficiency, productivity and safety. Korean Air provides maintenance support for foreign airlines operating through Seoul including Ansett, Air France, British Airways, Air Canada, Lufthansa, Singapore. Korean Air will become a great global leader largely through the dedication of our 15,000+ employees and their ability to adapt to a changing business environment. Our employees are enthusiastic and are building plans to reach and exceed their goals, and systems are in place that are producing an efficient work environment. But efficiency in our business does not affect professional development, and we are maintaining &endash; and even increasing &endash; the many training opportunities we provide our staff. All of us at Korean Air pledge to continue to provide superior service in a safe and secure environment that is beneficial for our passengers, customers, colleagues and employees.